Our school horse of 4.5 years, Sage, passed away on 2/27/19. He was over thirty years old. We'd like to share with you his memory page at www.CentaurRising.org/page/sage.html. Please email info@CentaurRising.org with your remembrances which we will add to this page. Donations to help defray the cost of his care in his final days are also appreciated. A HUGE thank you to all of our donors in 2018. Twenty-five thank you packages went out this week. In addition there are PayPal donors for whom we have no snail mail addresses and FaceBook donors who are unknown to us. Soooo ... if we missed thanking you personally, just send your address in a text to Kris at 303-847-9862 or email info@CentaurRising.org. Our 2019 schedule and registration form are now available on our Horse Camp page. Special offer: You can reserve a spot in one or more camps, if you fill out a registration form and enclose a $50 deposit for each camp selected. The balance of your $100/camp deposit will then be due 3/1/19. If you pay in full before 12/31/18, you may take a 10% discount! Our school horse of 16 years, Palaermo, passed away on 10/12/18. He was 25 years old. We've created a memory page for him. Please email info@CentaurRising.org with your remembrances or any condolences you would like to share on this page. Donations to help defray the cost of his care in his final days are also appreciated. Please check out our "Give the Gift of Horses" page. We are also excited to once again offer our "End-of-the-Year Half-Price Specials". Our 2018 schedule and registration form are now available on our Horse Camp page. Special offer: You can reserve a spot in one or more camps, if you fill out a registration form and enclose a $50 deposit for each camp selected. The balance of your $100/camp deposit will then be due 3/1/18. If you pay in full before 12/31/17, you may take a 10% discount! This show was unfortunately canceled due to the extra rain this year. We are sorry. Please check out our shows for next year. Eight horse camps were held this year with a total of 62 campers and 12 counselors. Our faithful hardworking counselors included the following: Avery Browne, Cyra Evans, Isabelle Gardiner, Sarah Gates, Shaylee and Shelby McMillan, Natalie Miller, Kaitlyn Orton, Shelby Popp, Tayah Rice, Kylie Spinsby and Riley Wilson. Thank you to all! We had great weather for our first show of the season. The judge was Wendy Fryke and Technical delegate Maryjo Hoepner. High point riders were as follows: Junior/YR - Cheyenne Hutchison, Amateur - Linda Gaber and Open - Sabine Preisinger. We had 25 exhibitors in 47 classes. Results can be found here. 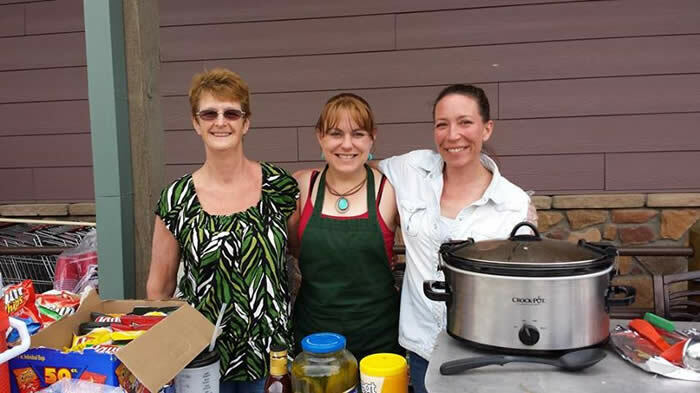 Centaur Rising hosted the spring fundraiser for the Mountain Resource Center. Please check the attached flyer. A big thank you to Evergeen's Canyon Courier for this wonderful article. More than 200 people attended this highly successful event in our indoor arena. Three of our school horses posed for photos for party goers. A nine-piece band played. The Kentucky Derby was televised. Derby hats were judged, mint juleps served. Great fun for all! We were honored to host Fred Kappler again his year. We had a total of twenty riders in these clinics. Read more about Fred here. To stay abreast of Centaur Rising news, please "like" our Facebook page. We had 78 campers in eight camps. These included Little Kids' Camp, Basic Horse Camp, Advanced Horse Camp and Dressage Camp. Check out our beautiful poster for 2016! Both our Executive Director, Kris Cooper, and her student, Le Tousey, earned their Century Club awards this year. They each exhibited on our 30-year-old rescue horse, Sage. Nothing old about these three! Congratulations to former students (1999-2002), Krista Nordren, for becoming the 2014 National Reserve Champion at Prix St. Georges with her horse, Schando. Krista also earned her USDF gold medal this year! began 1/1/15. To start the year, Kris interviewed Foothills members. The results of these interviews were presented to the RMDS board in January and March. As a result of these interviews four new Foothills events are planned. Check them out on our events page, also on the Foothills website. Please join us in one or more of these events! Yes, we are once again offering Horse Camp this year. We'll be adding a new type of camp, Advanced Horse Camp, for youth who have already participated in our Basic or Intensive Camp programs. In addition we offer a Dressage Camp as well as our very popular Little Kids' Camp. Click here for our registration form, which features the dates for each of our camps. Katryna Evans, a student from 1998-2004, made her grand Prix debut in Wellington Florida aboard the horse, Schumacker Solyst. Winning two scores over 60%, she is well on her way to earning a gold medal from USDF. She also rode DeLaureate at third level for a winning score of 73.533%. Way to go, Katy! Kaitlyn Janosik is now on staff as an assistant barn manager at Anchorage Farm. Kaitlyn will be assisting with Horse Camp in 2014. Kaitlyn atarted lessons with her mother when she was a pre-schooler in 1994. She showed StarDuster in the Colorado Classic Horse Show in 1997. 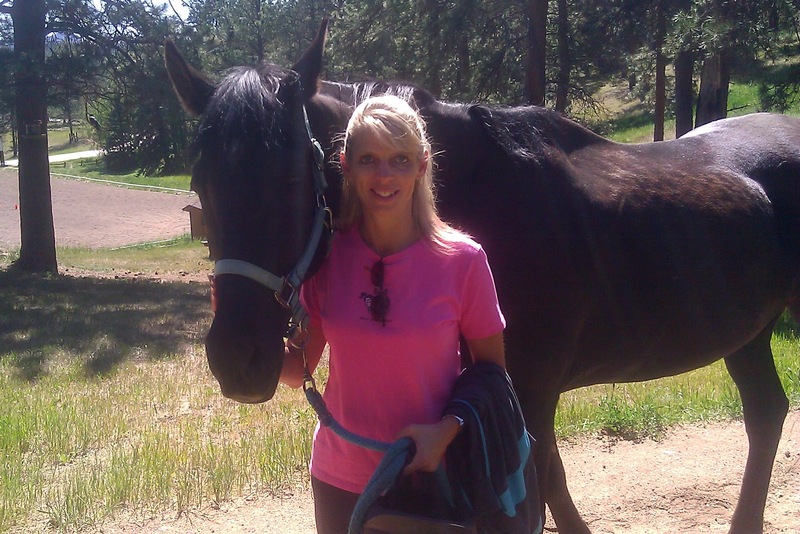 She since has earned an associates degree in animal science with an equine specialty. Welcome beck Kaitlyn! 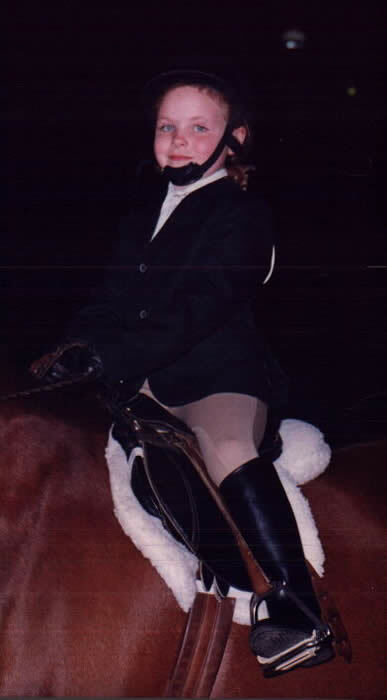 Hannah Leventhal took riding lessons at Anchorage Farm 1997-2001. She is now a student of veterinary medicine at Kansas State University. She is already receiving international recognition for her research on the prevention of laminitis. We are very proud of our small role in nurturing Hannah's love for and commitment to horses. The inaugural National Dressage Finals was held this weekend in Lexington Kentucky. One of our former students (1999-2002), Krista Nordgren, now of Portland, Maine, competed with her 17-year-old Dutch warmblood, Schando. We are delighted to learn that Krista and Schando won the National Reserve Championship at Prix St. George. They were second only to Akiko Yamazaki, owner of the Olympic dressage horse, Ravel. Read about them here in the Chronicle of the Horse. Then take a look at this video: A narrator critiques. Three judges' scores for each movement are posted during Krista's test. 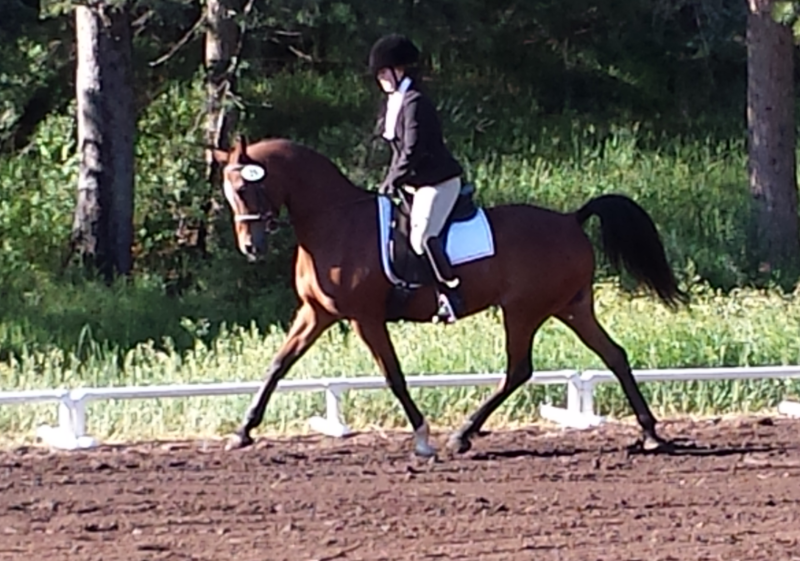 According to Krista, "Kris and Jim helped me win my very first blue ribbon at dressage: an intro (walk-trot) test! 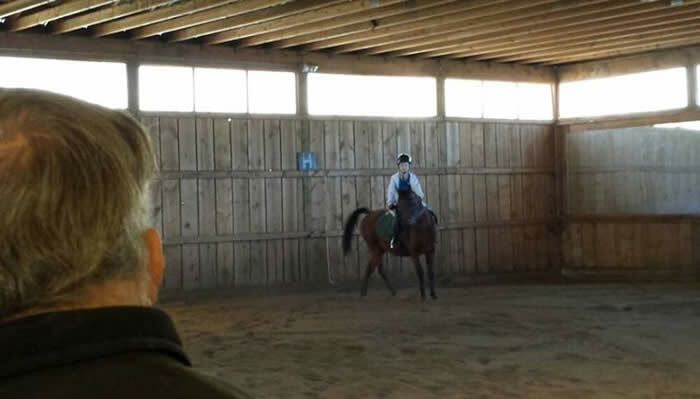 I never dreamed of doing tempi-changes and pirouettes at the Kentucky Horse Park. What a journey. Thank you." Fred Kappler pushes us and encourages us at the same time - with piaffe, passage, half pass, renver. He confirms our classical foundations, refines our communication skills and our commitment to improving every horse. From green horses to grand prix movements, Fred taught 21 riders from age 12 to 69. And a good time was had by all! Pam DeVore, a student from 1998-2005, is moving with her family to Oklahoma. She stopped by today to donate three dressage saddles to Centaur Rising. Pam's daughter, Brooke, who took lessons 1995-2005, will graduate from Oklahoma State University in December. Pam's younger daughter, Kailey (student 2002-2005) has distinguished herself through both Rocky Mountain Dressage Society championships and Colorado State Fair 4-H championships. We are proud of introducing this family to dressage! Nicole Riffe, a faithful student at Centaur Rising since January, has always wanted her own horse. Nicole has worked very hard to develop the skills and balance to do her own horse justice. On September 5, that opportunity presented itself. Anne Cole, longtime friend of Centaur Rising, told us about a horse started by a friend of hers. White Diamond Dancer was bred by Spirit Dancer Appaloosas of Buena Vista. It is a joy to see Nicole realizing her dream! Our Rocky Mountain Dressage Society sanctioned shows provide our students with the opportunity to showcase the horsemanship they have learned at Centaur Rising. It takes courage to enter the arena with your horse alone in a dressage show. Our students work long and hard to develop the partnership needed to perform well. Hosting a show also takes a community of volunteers. A big thanks to all who made our show a success: Simone Windeler, judge; MaryJo Hoepner, technical delegate; Sarah Gardiner, EMT: ring stewards, Diane & Cori Carter; office staff, Margaret Berry, Christy Cragin, and Carson Apps; scribe, Suzanne Stevenson; lunch, Carson Apps; runners, Maurita & Meadow Newton, Izzy Gardiner. We had 21 exhibitors in our August show. Results are here. 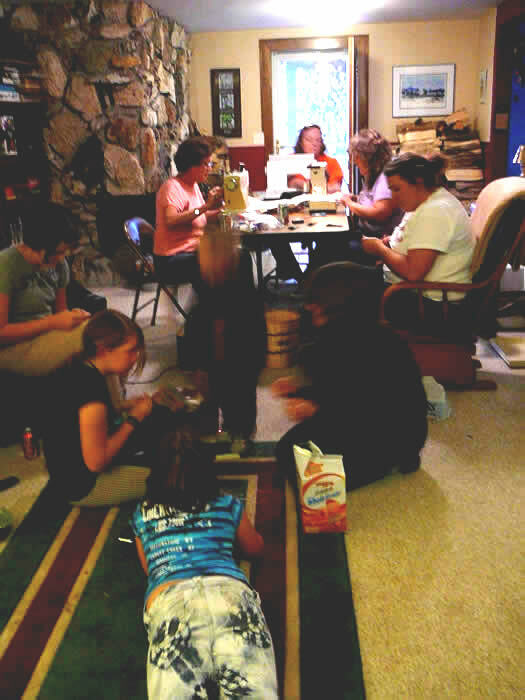 Centaur Rising hosted eight horse camps this summer. These camps provided the opportunity for our more advanced youth students to share with others what they have learned. Teaching less experienced campers gives them the opporuntiy to further refine their skills of communication and compassion. We are extremely proud of the 20 counselors who worked at our camps this year: Cori Carter, Kayla Dailey, Cyra Evans, Sarah Gates, Rory Gearhart, Brianna Gregory, Kaylie Hock, Skye Holdridge, Paula Massopust, Shelby McMillan, Natalie Miller, Ciara Moe, Sophie Redden, Tayah Rice, Jade Solomine, Allie Stadstad, Alex Stevenson, Sam Stevenson, Acacia Sublette and Riley Wilson. 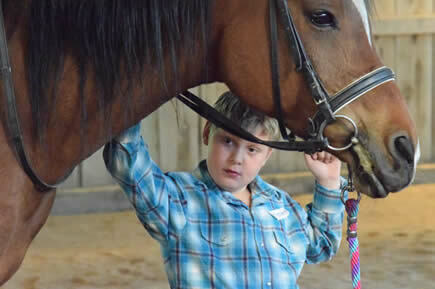 There were 69 participants in horse camp this year, including 24 from the Rocky Mountain Dyslexic Camp. (See photo.) Read more about our horse camps here. 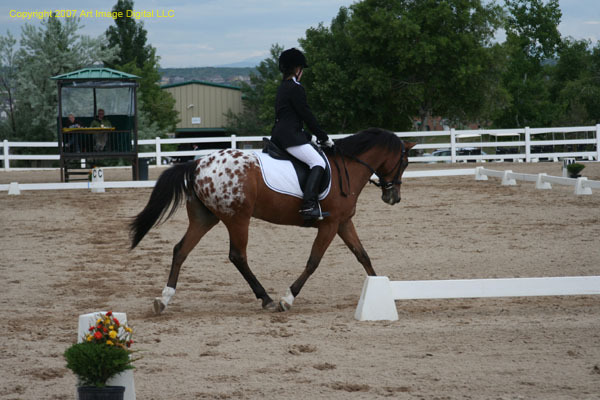 We had nineteen participants in our July Rocky Mountain Dressage Society sanctioned show. A big thank you to our horse show staff: judge, Julie Haugen; technical delegate, Jeannette Hillery; ring stewards, Jonathan McMillan & Diane Carter; secretary, Margaret Berry; office staff, Carson Apps & Christy Cragin; EMT, Anne Cole; runners, Kat Tinch & Cyra Evans; reader/arena maintenance, Jim Cooper. Thank you all for a smooth running show! See the results here. Fundraisers are really important to Centaur Rising since revenues do not cover the costs of our programs. Our hardworking Board of Directors hosted two fundraisers this weeked. We served lunch at the local store, Big R. On Sunday we had a second fundraiser at Beau Jo's Pizza in Evergreen. Thank you to Alyssa McMillan for organizing these events and to Jonathan McMillan, Carson Apps, Tish Joros for volunteering. Prince came to live with us at Centaur Rising this summer. His owner, Trish Gearhart, felt that dressage lessons would enhance her family's flox hunting with Prince. 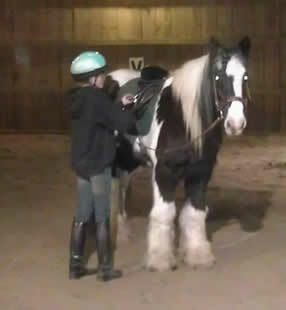 Daughter, Rory was a participant in After School at the Stable. She participated in Dressage Camp and was a junior assistant counselor for horse camp. The Gearhart family gave us permission to use Prince for other students during Horse Camp. Thank you, Trish and Rory! We are sad to announce that the horse of long-time student, Emily Garin, passed away today. Like Bonnie, Rocky's old knees could no longer safely carry him. We hope they are both galloping as young horses through the fields of heaven. Rocky gave Emily great joy. We know he will be greatly missed by the Garin family. They have our sympathies. 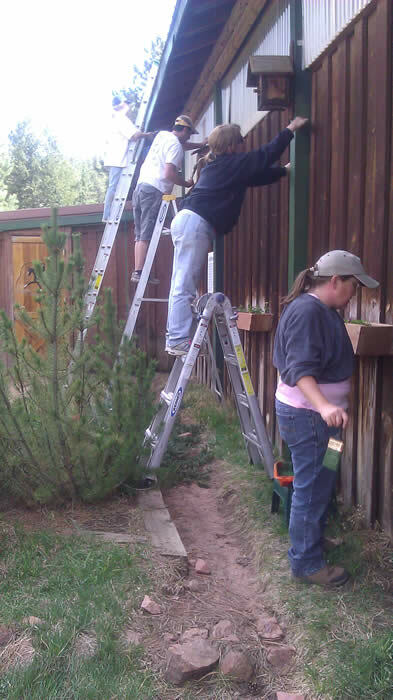 We had beautiful weather for our "Spring Spruce Up" lead by Centaur Rising's indomitable Board of Directors. We had awesome volunteers. An equally impressive list of local merchants donated paint, lumber and supplies. A big thank you to our volunteers: Michael & Carson Apps; Katherine Bryon; Diane & Cori Carter; Christy Cragin; Becky Guerra; Kara Jones; Jonathan, Alyssa, Shelby & Shaylee McMillan; Natalie Miller; Chris Perez; Tayah Rice; Suzanne Stevenson; and Jeremy, Joey & Riley Wilson. And more thank you's to our generous donors: Home Depot in Bergen Park, Home Depot in Lakewood, WalMart in Bergen Park, Ace Hardware in Conifer, Murdochs in Littleton, Subway in Conifer and Alco in Conifer. What did we do? We painted trim on the barns and arena. We painted the front fence, decks and picnic tables. We raked pinecones and pine needles. We remodeled gardens, built flower boxes and planted annuals. Wow! Come visit! An expecially big THANK YOU to Jonathan McMillan who nursed this idea into reality and to Alyssa McMillan who solicited a whopping $1400 in donations! It is very painful to announce that our wonderful school horse, Bonnie, our 27-year-old thoroughbred, joined our herd of school horses in the heavens. As one of our FaceBook readers posted, "She's been promoted to an angel now". A big thank you to Marilyn and Meghan Quigley who donated Bonnie to Centaur Rising. A big thank you to Riley Wilson, Rebecca Barker and Sarah Gates for helping to make Anchorage Farm festive for the season! Indy is a 20-year-old Gypsy Tinker, imported from Ireland. His owner, Nancy Glenn, has graciously lent us Indy to be used as a school horse during the winter season. Nancy needs all of our prayers as she recovers from unexpected radical cancer surgery. Centaur Rising had a booth at this event. We have had numerous students from Marshdale over the years. It is always fun to introduce new people to our programs. We were very much honored to have a former student return to give us a clinic. We introduced Kim Elsner and her family to dressage 20 years ago. 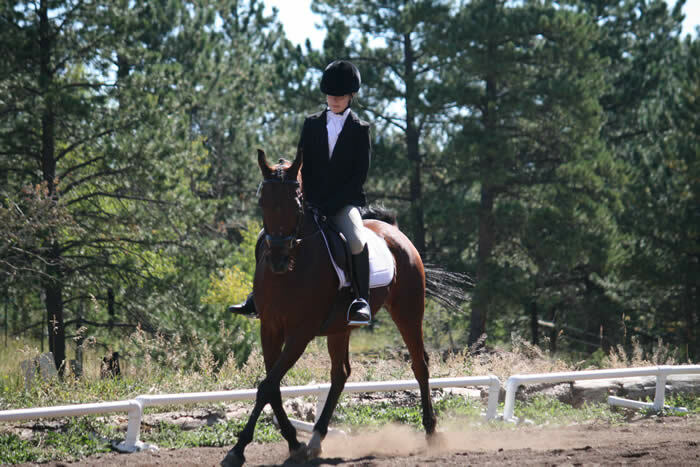 Kim has gone on to earn many awards from the Rocky Mountain Dressage Society. 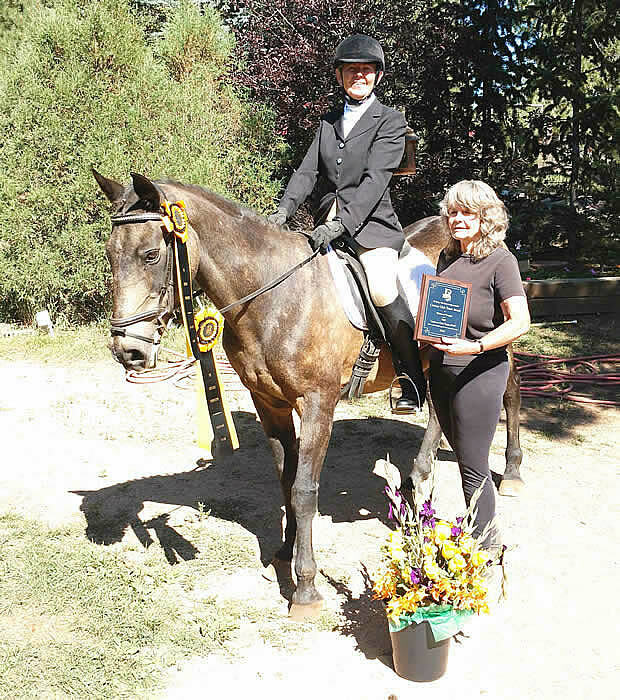 Now assistant trainer to Hilda Gurney in Moorpark, CA, Kim has won numerous Colorado Dressage Society and United States Equestrian Foundation regional championships in California – all the way to Grand Prix. One of our auditors remarked, “Kim teaches just like you do.” Yup, that’s what we do here! Once again, a former student used Centaur Rising horses in her Science Fair project. Shannah Brass and her father patiently took pulse readings on 14 horses. Good luck Shannah! Our following students received awards at this year’s Rocky Mountain Dressage Society's annual banquet: Cori Carter, Sarah Gates, Sam & Alex Stevenson and Connie Williams. Congratulations all! In response to Seemo’s death, Suzanne Stevenson gratiously offered her 20-year-old Morab as a partial replacement for Kaseem as a school horse. Dakota has been a part of Centaur Rising since 2005. Thank you, Suzanne! The Conifer Rotary Foundation once again gave Centaur Rising a grant to partially fund scholarships for our “After School at the Stable” program. Thank you SO MUCH Confer Rotary! After receiving the Rotary award, Kris came home to find Kaseem in his stall with a terrible headache. He suffered a fatal neurological event, a brain tumor or aneurysm. Kaseem, at age 17, was our best school horse. He lived with us for 16 years. Donations in Kaseem’s name will be used in his memory to support our kids’ programs. Thank you for helping! Five of our students were qualified to ride in the RMDS Championship show: Cori Carter, Sarah Gates, Alex & Sam Stevenson and Connie Williams. Not bad after only two shows! Alas we could not go. Our horse trailer has no license. Jim Cooper, one of Centaur Rising’s instructors and the chief caretaker of our horses, underwent knee replacement surgery. The surgery was unfortunately not successful. His knee is very stiff even three months later. He is adapting the truck and tractors to enable him to still drive, but horse shoeing is out of the question. Barn manager, Doug Jones, has stepped up to assume many of Jim’s previous horse-care duties. Thank you, Doug! Our summer dressage shows give our students an opportunity to showcase what they and their horses have learned during the preceding year. We had ten riders in this our second show. Julie Haugen was the judge and Jeannette Hillery the technical delegate. Abby Page won high-point junior and Lee Thomas high-point open. Results are posted here. We had seven camps with a total of 60 participants this year. Camps not only introduce new comers to horses, they also give our more advanced students the opportunity to develop teaching and supervisory skills. Our counselors are awesome! Here is a list of all those who helped with camp this year: Cori Carter, Adri Domurat, Cyra Evans, Sarah Gates, Kaylee Hock, Sadie Lozensky, Paula Massopust, Devine Matthews, Natalie Miller, Ciara Moe, Abby Page, Elyssa Redden, Sophie Redden, Tayah Rice, Alex Stevenson, Sam Stevenson, Acacia Sublette, Sarah Walker and Riley Wilson. Katharina grew up in Germany and learned to ride there. She has come to us for more lessons, as she prepares to ride on her college equestrian team. Thank you to all who made our first 2012 dressage show today a success: Margaret Berry, Christy Cragin, Carson Apps in the office; ring stewards Diane Carter and Dave Melling, Suzanne Stevenson, scribe; Kathleen Mayger, judge; MaryJo Hoepner, technical delegate; Cyra Evans, head runner; Alyssa McMillan, grooming coordinator: Jim Cooper, reader/arena groom; Mike Lacey, printer repairman. We had 18 riders. Cori Carter was high-point junior with a score of 71.96%, Linda Gaber was high-point amateur and Lee Thomas high-point open. Full results are posted here. In July our esteemed junior counselors taught horseback riding to 33 students of the Rocky Mountain Dyslexic Camp. The campers and staff were attentive, respectful and a lot of fun. We look forward to working with the Rocky Mountain Camp again next year! Kim Beal of Indianapolis was awarded a Teacher Creativity Fellowship from the Lilly Endowment. Kim tells about her experiences at Centaur Rising in her blog. Go to Kim's pages "Lessons:Day One" through "Saying Goodbye to Colorado". Kim relates her frustrations and accomplishments in learning to those of her students learning in her classroom! Centaur Rising is located at Anchorage Farm, who celebrated their 31st anniversary at the same location this year. The celebration was held in the indoor riding arena. We put together a big-screen slideshow of 31 years of Arabian horse shows, horse camps, dressage shows, parades, 12 years of trail riding with a special use permit in the National Forest. Centaur Rising’s Board of Directors committed many hours to this event. We had great food and live music! Our silent auction was a successful fundraiser. Click here for more information about this event. Christy Cragin’s generous and timely donation enabled Centaur Rising to purchase the Arabian gelding, Annie’s Darq Side also known as “Rainbow”. He went right to work in all of our summer horse camps. Natalie Miller showed him in our dressage shows. Rainbow has lots of potential as a long-term show-quality school horse for Centaur Rising. Carolyn and her mother traveled here from New Jersey to take lessons at Centaur Rising. Carolyn was preparing for the Pony Club Championships in July in Virginia. She worked on developing a better connection “from her leg to her hand”. Amy Dunn, a student since 2005, called to say she wanted a western riding lesson. 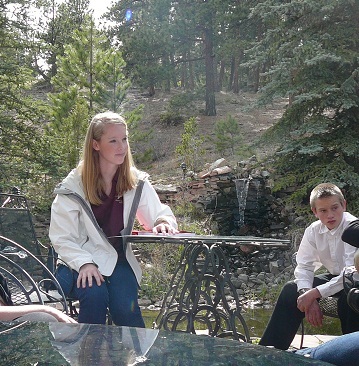 After her first year in pre-med, Amy had been hired for a summer job as a wrangler at Camp Cheley in Estes Park. Kris said, “You don’t need a western lesson. You know how to ride.” Indeed what we teach can be applied to any discipline. Dressage is the foundation for all riding. Amy did take her lesson. She learned about western tack and slowing the horse for jog and lope. Centaur Rising's instructors have shown western pleasure for many years. They were outfitters in the Pike National Forest for 12 years. We had 18 participants in our May clinic with Fred Kappler. As usual, he delighted and inspired us all. In the international equestrian world we often look to Europe as the birth place of dressage and the keepers of all standards of excellence. It is always surprise when riders come to us from Europe to learn more! We were honored to teach Parisian horse owners, Gill and Pasqual. Do you know that we have given riding lessons to students from all seven continents of the world? Jim and Kris Cooper, owners of Anchorage Farm, will host a 31st Anniversary Party on Saturday, June 9, 2012, from 5-10pm in the indoor arena at 12889 S. Parker Avenue, Pine, CO 80470. The party will include food, music, dancing and a big-screen slideshow of photos of students over the last 31 years. Past students are warmly invited to an evening of reunion and reminiscence. The public is also invited. All you need to do is RSVP to Kris@AnchorageFarm.com to let us know you are coming! Click here for more information. Volunteers are also needed. Click here to see what you can do to help! Kim & 4-year-old Nicolette Masitti are proud new owners of "Annie's Darq Side", a 14-year-old purebred Arabian sporthorse gelding. 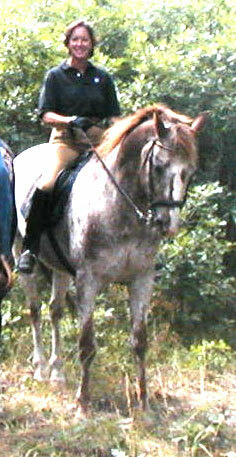 "Rainbow" became the 3rd bay Arab gelding at Centaur Rising. Congratulations Kim & Nicolette. Congratulations to Kim Beal of Indianapolis, who has been awarded a Teacher Creativity Fellowship from the Lilly Endowment. 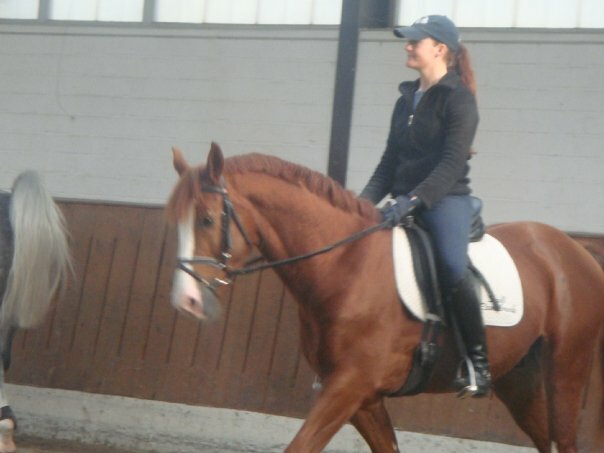 Kim has chosen to use part of her grant to study dressage at Centaur Rising in June 2012! She will be blogging to her 3rd grade students about her experiences in Colorado. We are honored that Kim chose US. Please join us in welcoming her. Thank you also to Lilly Endowment, Inc.
Shannah Brass, a student of After School at the Stable during 2010-2011, just won first place in the zoology category in her school and third place in regional competition. 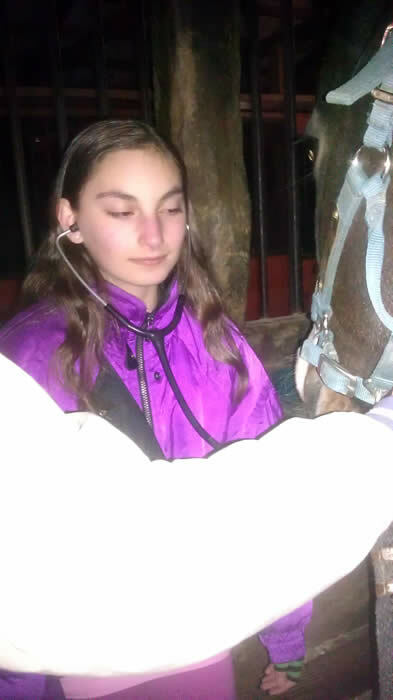 Kris provided consultation for Shannah as did staff of the Colorado Therapeutic Riding Center. Shannah's hypothesis was that horses behave differently when a physically disabled student is riding them. Congratulations, Shannah, for your hard work, careful observations and good thinking! Please share the attached flyer, compliments of Ana Joros. Former student, Brooke DeVore, is now instructor/trainer at Noble Acres Farm in Stillwater, Oklahoma. Best of luck to this busy college girl! Nic Sigler is competing successfully at Intermediare I in California. 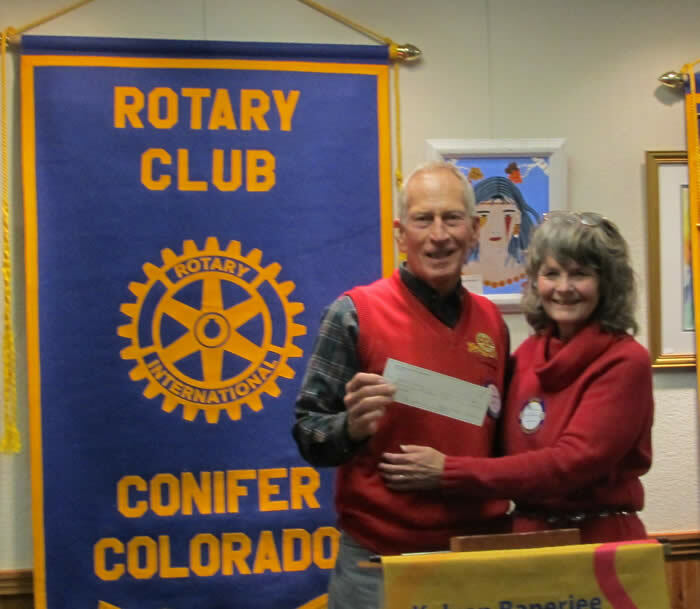 Suzanne Barkley of the Conifer Rotary Club invited Kris Cooper to give a presentation on our organization to theirs. Alyssa McMillan assisted. The audience seemed to really like the program! Click here to view it. (It will take a little while to load.) Sorry you'll miss Kris' narrative. This pictures are lovely, though... Thank you - again - Conifer Rotary! Full "After School at the Stable" scholarships have been awarded to Aspen Birdsong and Tayah Rice. These scholarships will enable participation through May. Thank you to those of you who applied. Thank you Conifer Rotary! 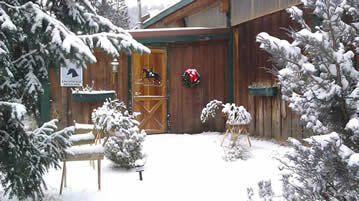 The Conifer Rotary Club has generously awarded four one-half scholarships to "After School at the Stable" through the end of the 2011-12 school year. To have a child considered for this special opportunity, please complete this application. Tell anyone who might be interested. This program is limited to the local Conifer/Bailey/Evergreen foothills communities. (Pictured at left is Executive Director, Kris Cooper,accepting the award from Ed Steinbrecher of the Conifer Rotary Foundation.) Thank you Conifer Rotary Club! The Christmas holidays are always a very difficult time for Centaur Rising. Students tend to delay paying for more riding lessons at this time. The poor economy has made this year especially challenging. We want to thank the following people for enabling our horses to continue to receive good care this time of year: Margaret Berry, Cori Carter, Diane Carter, Mike Lacey, Natalie Miller and Riley Wilson. You folks are awesome!!! Thirteen riders participated in our November dressage clinic with Fred Kappler. Fred's great about introducing us to new movements/patterns, encouraging us to do more and inspiring us. Don't miss one of our clinics scheduled with Fred for 2012. Our clinics are also a lot of fun! Please don't be shy about coming to watch the lessons, join us for lunch and our traditional Saturday night potlucks. 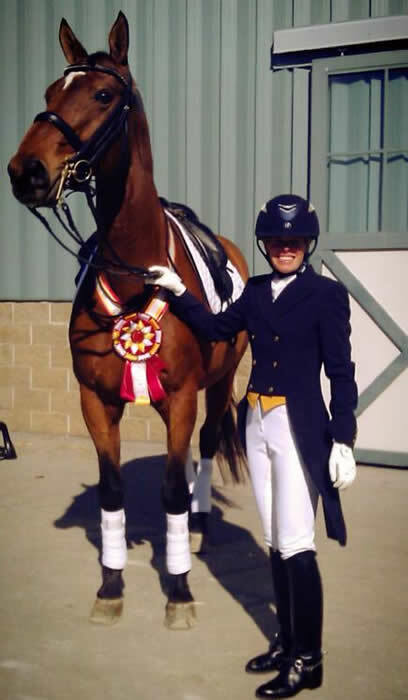 Congratulations to former student, Kim Elsner, who won two Region 7 championships at the California Dressage Society Championship Show this past week. She was riding Hilda Gurney's Trakehner gelding, Luminence. Her score in Open Prix St. Georges was 68.816% and at Open Intermediare I is was 69.342%. We introduced Kim and her family to dressage in 1992-1995. Her subsequent successes would of course not be possible without her diligent hard work and determination. Kim is also a graduate of Colorado State University. Congratulations to two former students for their amazing personal triumphs at this show. Christina Rudman won the Open Training Level Championship on her homebred mare, Chasse', with a score of 74.6%. Kailey DeVore won the Junior Training Level Championship with a score of 70.2%. Both families were introduced to dressage at Anchorage Farm, the Rudmans 1997-2002 and DeVores 1997-2005. Congratulations for their continued successes! A big thank you to all of the exhibitors and volunteers who made our third show of the season a big success. Results have been linked from our Events page. Kathy Simard was our judge; Susan Selby, our technical delegate. Anne Cole drove all the way from Guffey to be our emergency medical technician. Tammy Devine, a student of the judge, drove with her husband from Fairplay to serve as scribe. Margaret Berry had an over-the-top day working very hard to keep the office running smoothly (despite some pre-show mistakes by yours truly, the show manager!) Mike Lacey intervened to fix equipment problems (as well as my faux pas). Thank you, Mike! Sean Lozensky stepped in to serve as the early morning warm-up ring steward. He was relieved by Mike Lacey (so that Sean could show). Then Dean Miller took over so Mike could show. Dean Miller also helped with posting flyers. Diane Carter served as our able outdoor ring steward. Andy Carter took photos, a very much appreciated service! Christy Cragin stepped in at the last moment to help with scoring. I have no idea how we would have pulled through without Christy’s help! Natalie Miller also enlisted the aid of two of her friends, who contributed as runners. This relieved Sadie Lozensky so she could show. Bryn Carter was also runner. The runners somehow managed to snap show photos as well! Dean Miller and Margaret Berry took down the office as efficiently as they had set it up. Thank you for this also! Jim Cooper readied both show and warm-up arenas and served as reader for a majority of the exhibitors. Rebecca Barker, our barn employee, took the time to also take exhibitor photos. This is appreciated immensely. Thank you, Rebecca! Cori Carter cleaned up the lounge and tacking-up area pretty much single-handedly before the show. All of the above jobs are essential to hosting a show. The show cannot go on with all these volunteer hours. Thank you. Thank you. Thank you. Business Wire, a Berkshire Hathaway Company, is celebrating its 50th anniversary by giving back to local communities. Thomas Shelley, a former student and financial contributor to Centaur Rising, is an employee of Business Wire. Thomas has been donating his Tuesdays to do strategic networking with other local non-profits, schools and businesses. Thank you Thomas. Thank you Business Wire! A big thank you to all of the exhibitors and volunteers who made our first show of the season a big success. Results have been linked from our Events page. Thank you to our volunteers: Margaret Berry, secretary; Brian Gardiner, scorer; Sarah Gardiner, scribe; Tish Joros, outdoor ring steward; Mike Lacey, indoor ring steward; Ana Joros, reader/runner coordinator; Jim Joros, grounds preparation; Tish Joros, test preparation. Elyssa Redden went out of her way to help others with show grooming. Students did a great job cleaning up the tack area both before and after showing. After the show, many of them helped Rebecca Barker clean stalls. Beth Geier was our judge. Our technical delegate was Mindy Maguire. Thank you to all who made our show a success! Hope to see you at our July show. Long-time former student, Katryna Evans, passed her Bereiter examination today in Warendorf, Germany. This achievement culminates many long years of work at Stall Ramsbrock in Menslage, Germany. A Bereiter has passed through the apprenticeship system to earn the title of Trainer. Top US dressage trainers like Steffan Peters, Guenther Seidel and Jan Ebeling started their careers as Bereiters. We are very proud of you, Katy!! A big thank you to ALL 40 volunteers who made Centaur Rising’s April 17 barn sale such a success. Elizabeth Luchenberg spent weeks of organizing and pricing, distributing flyers, advertising on CraigsList, assisting with customer checkout and managing takedown. Sarah Sherry cleaned piles of tack, helped organize, hung flyers. Suzanne Stevenson posted signs on the roads, ran the cash register Sunday afternoon. The following helped set up and price on Saturday: Natalie Miller, Ana Joros, Jonathan Sinnock, Sarah Gates, Ashlie Arnold, Cori Carter, Abby Page, Doug Jones and Sam & Alex Stevenson. The following helped unbox, price and display: Suzanne Stevenson, Tish Joros, Christy Cragin and Elizabeth Luchenberg. Becky Guerra generously donated food and paper items for lunch. Her granddaughters, Divine and Tayah, assisted. (We’ve frozen leftovers for horseshows!) Thank you to the following for donating the use of tables: Diane Carter, Ashlie Arnold, Connie Williams, Alma Wirth and Christy Cragin. Kristen Bailey baked and manned an amazing bake sale. Her daughters Sofie and Elyssa assisted. Anne Cole cooked and served hotdogs for lunch. Jim Cooper hauled tables, set up displays. Diane Carter and Jennifer Reeve manned the cash register Sunday morning. Anne Cole and Savannah Reeve assisted with pricing early Sunday. Elyssa Redden and Ana Joros processed credit cards. The following were in charge of stall cleaning and hospitality: Ana Joros, Abby Page, Cori Carter, Jonathan Sinnock and Dianna Bales. Thank you to the following for submitting items to the sale: Jennifer, Tom & Savannah Reeve; Ana & Tish Joros, Suzanne Stevenson, Abby & Stacey Page, Elyssa Redden, Anne Cole, Marlene Schulte, Sarah Cohen and Cindy Loftus. (Sorry if I missed anyone!) Thank you to the following for helping take down the sale: Suzanne Stevenson, Brian & Sarah Gardiner, Tish & Ana Joros, Doug Jones, Jim Cooper, Jonathan Sinnock, Anne Cole, Christy Cragin, Eleanor Luchenberg, Jennifer & Savannah Reeve. Oh yes, Kris Cooper placed ads, printed price tags and flyers, made multiple “to do” lists and generally “bossed people around”. Thank you to this fabulous crew!!! Proceeds support our summer youth programs. Kathleen Carter, a graduate student at the “Center for Performance Excellence” at the University of Denver, offered her time (and that of one of more colleagues) to help Centaur Rising students prepare for the 2011 show season. Kathleen helped us use relaxation, confidence and imaging exercises. She encouraged us to support one another as a team in this effort. Our kickoff was held on Sunday, April 10. Kathleen met with us many times since then. Thank you, Kathleen! A big thank you to Diane Carter for managing our campaign. The winner of a gift certificate to the Tack Shack was Natalie Miller, who had the most sales. She was closely followed, however, by Cori Carter and Suzanne Stevenson. Thank you so much to all who participated in this fundraiser. This year every one of our ongoing students and their horses have established goals and objectives. The horse goals (for 24 horses) can be seen on a white board in our tacking-up area. More advanced students help the horses achieve their goals. Not a student of Centaur Rising? We welcome you to join our most progressive new year! Our new Facebook page is www.facebook.com/CentaurRising. Please join us by clicking the "like" button on that page. Don't miss fun discussions, updates, videos, events and more! Congratulations to Carey Beacom for being accepted into vet school at Colorado State University! 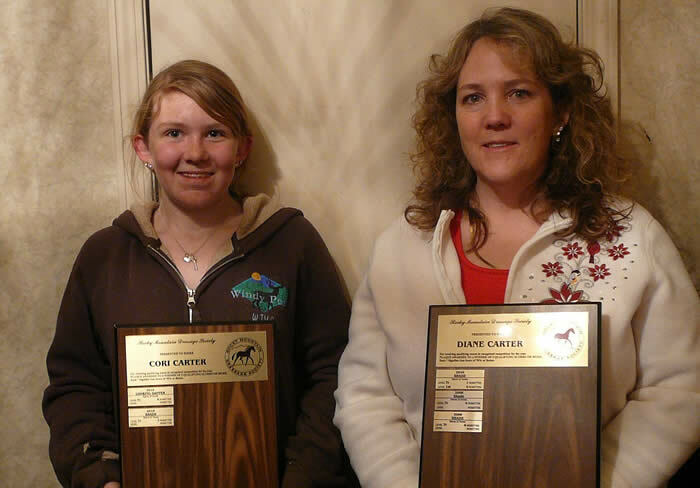 Congratulations for Cori and Diane Carter and Sarah Gates for earning plaques at the 2010 Year-End awards banquet. These plaques were awarded to riders who earned five or more scores of 60%+. Twenty-two riders participated in our dressage clinic on twenty horses. As usual we learned a lot and had much fun as well. Check our Events page for our next clinic with Fred. Here is a list of this clinic's participants. Looking Dapper, age 30, owned by the Ritterbusch family, has been on loan to Centaur Rising for the last two years. He helped earn Cori Carter her RMDS year-end award. Beloved by many students, Dapper left this world on November 28. He was surrounded by the love of his owners - Don, Valerie and Dana, who had shared their lives with Dapper for 27 years. We trust that this exceptional horse now grazes in eternal pastures that are far greener than those of Colorado. We will miss him! Thank you to the Ritterbusches for sharing him with us. Look for our ad in the 2011 Omnibus. We're setting up a Centaur Rising page on FaceBook. Check back for more updates. Christy Cragin, a Centaur Rising board member, hosted the first Braidtastik sewing bee. Thank you to Christy for hosting, Valerie Ritterbusch for organizing and the following additional workers: Bryn, Cori & Diane Carter; Adriana Domurat; Sarah Gates, Sarah Gardiner; Elyssa Redden; and Alex, Sam & Suzanne Stevenson. The braiding kits will be available for sale soon! Some transformations: the youngest one an assertive trotter, the shy slouching one so erect and proud (her mom did not recognize her), the fearful weeper a big-time grinner – all due to our counselors – problem-solving together, compassionate, resourceful, FUN. Thank you all! The results of our second show of the season are posted here. Alex Stevenson on Grandbeau took the High Point Jr/YR award with a 73.5%. Grandbeau was bred and raised by the Stevenson family. Isabella Delaney of Boulder once again took the High Point Open and High Point Pony award with her horse, Peppy Wood Smoke. We had 26 exhibitors in our second RMDS-sanctioned show of 2010. Gwen Ka'awaloa was our judge and Jeannette Hillery our technical delegate. A big thank you to our volunteers, most of whom served again as they did at our last show. Noteworthy additions were Cathlin Rice and Brian Gardiner as much-needed office staff. Thank you. The results of our first show of the season are posted here. Rachel Melling on Jasmijn took the High Point Jr/YR award. Isabella Delaney of Boulder took the High Point Open and High Point Pony award with her horse, Peppy Wood Smoke. We had 19 exhibitors in this, our first Rocky Mountain Dressage Society sanctioned show of 2010. We wish to thank Beth Geier for serving as our judge and Susan Selby as our technical delegate. High Timber Times reporter, Barbara Ford, covered the show for Evergreen Newspapers. She says we should make the front page! Watch for it! A lot of volunteers are needed to run a show. Please join us in thanking all of the following (plus anyone we might have forgotten). Tish Joros did secretarial duties before the show. Margaret Berry manned the office at the show with help from Kathy Crawford and Jennifer Reeves. Mike Lacey helped set things up before the show and take them down. Valerie Ritterbusch was the judge's scribe. Kathy Crawford took still photos and Jim Joros videotaped the classes. Tish Joros was the outdoor ring steward and Dave Melling handled the indoor ring. We had two Emergency Medical Technicians (EMTs): Mark Miller and Kristen Bailey. Christy Cragin prepared lunch for show personnel. We appreciate those who made donations. Mike Lacey brought breakfast food, Kathy Crawford refreshments for exhibitors and Janel Domurat brought brownies. Ana Joros coordinated both runners and readers. Jim Cooper and Doug Jones maintained the arena. Diane Carter facilitated communications between the arenas. Please join us for our next show on July 18! We wish to thank everyone who made our first “Celebration of the Horse” open house a big success. The purpose of this event was to introduce potential horse owners some of the responsibilities of horse ownership. Mother Nature for supplying our first really gorgeous day of spring. Our guest speakers: Timberline Equine, Barbara Wright of Harmony Horseworks and Kathryn Hoffman of Pine Country Feed. We thank you so much for spending the day with us! Tish Joros for helping to organize the event and serving as our registrar. Natalie Miller for working at the registration table and helping in many other ways. Abby Page for cleaning up the tack room both before and after the event. Mike Lacey for helping to prepare for the event. Valerie Ritterbusch for organizing the quadrille. Our quadrille members: Cori & Diane Carter, Sarah Gates, Ana & Tish Joros, Mike Lacey, Abby Page & Elyssa Redden. Sarah Gates for giving a “work-in-hand” demonstration. Suzanne Stevenson, Mike Lacey, Margaret Berry and Kristen Bailey for bringing lunch. Dave Melling for serving with our guest speakers on our panel discussion. Jim Joros for videotaping and photography. Adri Domurat for helping to prepare horses. Anyone else we might have forgotten! Thank you all. We had so much fun we hope to do this again next year! As usual, Fred provided our 22 participant riders a most educational and enjoyable time. Each clinic provides us with the opportunity to show Fred our progress since last time. We are most grateful to Lindsay Dolan for sharing her beloved Sabre with us. Within the next month Lindsay's long-time partner, Karas Kajie, passed away. The following month Lindsay graduated from Colorado State University. Lots of changes in a short period of time. Lindsay was Kris and Jim's student for over ten years. There are many memories of Lindsay and Kajie. We mourn Kajie's loss with Lindsay. We congratulate her on her many achievements. We are most grateful to have Sabre a part of our lives. Twenty-five riders participated in our clinic. We enjoyed a great social time with our fellow riders. It is with great sadness that we inform you that our beloved Star Duster left this earth on January 29, 2010. He was 25 years old. As many of you know, Star Duster had a touchy digestive system for the 21 years we’ve cared for him. Jim prolonged his life by consistently buying feed just for him. Nutrena’s Safe Choice and Purina’s Ultium did the trick. As a result, Star Duster had had no colics for many years. On the fateful morning above, however, Star Duster greeted Jim in grave pain. His colon was not twisted, but displaced, the vet said. “Sometimes this happens in older geldings”, she said. It wasn’t just any older gelding…. It was our mainstay, our most dependable horse ever. Kris taught pre-schoolers with Star Duster for 18 years. She showed him saddle-seat. Jim showed him in pleasure driving, our daughter in hunter pleasure and western pleasure too. He had many reserve championships to his name, some at the regional level. As a young horse, he was undefeated at halter. Many, many of our students showed Star Duster too. 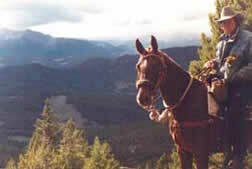 He took people on trail rides for all of the 12 years we held a permit in the Pike National Forest. He served 17 years of horse camp. Star Duster was the end of a legacy of do-it-all horses. Jim says we’ll never ever never replace him. We will be making a webpage to honor Star Duster with your memories and condolences. If you have photos to share, I’d love to include them. Please send them to Kris@anchoragefarm.com. Your tax-deductible donations in Star Duster’s name will be most gratefully acknowledged. We know many many of you loved Star Duster too. Twenty-four students braved the January cold to ride in our clinic. Thank you all for joining us! Jasmijn, owned by the Melling family, produced a colt when she was owned by Melissa Johnson. Melissa recently took him to the Friesian World Show and he came home World Champion 2 year old. Congratulations to Melissa, the Mellings, and most of all Jasmijn! We have received tentative approval from the Rocky Mountain Dressage Society for three shows to be held at Anchorage Farm again in 2010. Put these Sundays on your calendar for next summer: June 20, July 18 and August 15. Plan to RIDE! Jim Joros did an amazing job putting together a DVD of the quadrille video and photos of the reunion on 10/3/09. Mike Lacey made copies. We'll be giving a copy to each quadrille participant and mailing copies to the reunion attendees. If YOU want to see the DVD, come to the potluck at the Fred Kappler clinic on 10/24! Ten students performed an impromptu quadrille for special guests to Anchorage Farm. These were Kris's sorority sisters here for a reunion. We were very proud of the following participants in the quadrille: Cori Carter on StarDuster, Diane Carter on Shade, Lauren Crawford on Opie, Adriana Domurat on Bonnie, Sarah Gates on Kaseem, Ana Joros on Excalibur, Karissa Melling on Jasmijn, Natalie Miller on Dapper, Abby Page on Sonny and Elyssa Redden on Belle. Thank to Jim Joros for snapping photos, to Mike Lacey for helping prepare the arena and to Mike and Janel Domurat for fetching lunch for our guests. And a fun time was had by all! A big thank you to Kathy Crawford for displaying the wonderful photos in our riding arena. Kathy photographed the dressage show exhibitors and printed them at her own expense. She and her husband, Bob, framed them for us. Please take a look at these wonderful photos and join me in telling Kathy, "Thank you!" It was a great honor for me, Kris Cooper, to be asked to write a letter of reference for Claire Filkins as she takes a major step in her young life: applying to schools of veterinary medicine. Claire was a student for eleven years. She worked in our summer Horse Camp programs. I know Claire, her character and qualities very well. I thus can unequivocally state: "Claire would be a superlative representative for the field of veterinary medicine. I see her as not only providing excellent service to her own clients but a mentoring, leadership and advocacy role for the profession. People would have a higher regard for veterinary medicine after knowing Claire Filkins." This I believe. Congratulations to the following former students for their Championship wins this weekend. Claire Filkins took the Junior Young Rider First Level Championship with her horse Rhythm and Blues. Nic Sigler won the Junior Young Rider Prix St. Georg Championship with his gelding, Royal Diamant. Both are Royal Diamond sons. We are very proud to have started these students (each for four years or more) in their dressage careers and with these wonderful horses. Claire is currently in the process of applying to vet school. Good luck to her at this very important time! Congratulations to Tish and Ana Joros for their purchase of the gelding, Excalibur. Expect lots of wows next time these folks enter the show ring! It was another gorgeous day for 20 entries in another wonderful show at Anchorage Farm. We started the show with a debut by Suzanne Stevenson's Hanoverian x Appy colt, Grandbeau. This lovely colt was BORN at Anchorage Farm just three years ago. Just under saddle for four-weeks, Grandbeau completed his first test like a champ with a score of 60%. What a boy!!! Rachel Melling won the highest score of the whole season with a score of 71% on her new Friesian mare, Jasmijn. She was very closely followed by another Junior rider on her own horse - Abby Page on her five-year-old AQHA gelding, Sonny, with a score of 70.5%! Talk about the stars of the future! The Centaur Rising school horse, Shade, was also an under-sung star. Not only did she win her training level test one for her Junior rider, Ana Joros, in Ana's SECOND show. She also mopped up high point open for this show, as she had simarly done in the first show of the season. On both ocasions her rider was Diane Carter. Congratulations! We had two riders debuting in their first horse show ever: cousins Cori Carter and Laci Simonds. Both did SUPER - with Cori taking second only to the high-scoring Abby Page on Sonny! Full results are posted here. The technical delegate, Susan Selby, once again commented on our "great VOLUNTEERS" whom she lauded as "competent in their jobs". Diane Carter manned the office, Margaret Berry the scoring, Tish Joros the outdoor ring and Dave Melling, the indoor ring. Jim Cooper kept the arena in shape. Kaye McGann was our INDESPENSIBLE videographer. We learn so much by watching our DVDs over and over again! Kathy Crawford photographed. (We're anxious to see what she got!!!) Dean Miller manned the concessions. He was helped by Kathy and Bob Crawford. Christy Cragin and Kristen Bailey contributed food. Kristen was also our Emergency Medical Technician. (She didn't have much business though.... no falls in this show, not even close ... ) Mike Lacey was helpful in SO MANY ways. It takes a lot to keep things falling through the cracks! Cathlin Rice served as scribe for our wonderful supportive judge, Kathleen Mayger. What a great crew!!! Thank you. Thank you! Thank you!!! We had 22 entries in our second Rocky Mountain Dressage Society sanctioned show of the season. Winning the high point award for junior riders was Abby Page on her American Quarter Horse, Sonny. It was the very first show for both Abby and Sonny! High point open rider was Lee Thomas on her Conemara cross, Orion's Starman. Full results are posted here. The show was officiated by Beth Geier, judge; Susan Selby, technical delegate; and Kristen Bailey, RN, emergenccy medical technician. Our Technical Delegate noted in her official report that, "Volunteers are exceptional, knowledgeable of the rules and ready to help anyone when needed." Who were our wonderful volunteers? Cathlin Rice and Cindy Loftus manned the office. Tish Joros proofed entries. Margaret Berry was in charge of awards and Lora Mihelic, scoring. Our ring stewards, Dave Melling and Tish Joros, were once again key personnel responsibler for both keeping the show on time and for boosting participant morale. Radio communications between office and riding rings was made possible through the efforts of Dena Simonds. Abby Page recruited and supervised runners - enabling scores to be posted promptly. Sarah Sherry was in charge of hospitality. Christy Cragin ran the concession stand with the help of hot dog grill chef, Dean Miller. Christy purchased menu items at her own expense and donated all proceeds to Centaur Rising. Ana Joros coordinated test readers for participants. Our show memories have been immortalized through the efforts of our videographer, Kaye McGann, and our photographer, Kathy Crawford. Both videos and still photos are available for purchase. Please let our volunteers know that their efforts are so much appreciated by buying a video or photo. Click here for details. Weather was great. Grounds were beautiful. Thank you to all the volunteers and participants who made our second show a great success! We had eighteen entries in our first Rocky Mountain Dressage Society sanctioned show of the season. Winning the high point award for both junior riders and ponies was Kailey DeVore. Congratulations, Kailey! High point (and sole amateur!) rider was Linda Gaber. High point open rider was Diane Carter on a Centaur Rising school horse, Shade. Full results are posted here. Our show would not be possible without our volunteers. An e-mail from a new exhibitor says it all, " Everyone was so helpful and welcoming, it was wonderful!". Officials were Linda Ohlson Gross, judge; Jeanette Hillery, technical delegate; and Mark Miller RN, emergenccy medical technician. A big thank you to the following. Cathlin Rice manned the office. Mary Snyder and Tish Joros proofed entries. Margaret Berry was in charge of awards and Tara Hough, scoring. Our ring stewards, Dave Melling and Tish Joros, kept the show 100% on time - through Diane Carter-provided radio communications between office and riding rings. Cori Carter helped with exhibitor preparations, thereby calming nerves. Ana Joros recruited and supervised runners - enabling scores to be posted promptly. Becky Guerra ran the concession stand with the help of hot dog grill chef, Dean Miller. Becky purchased menu items at her own expense and donated all proceeds to Centaur Rising. Dean Miller, Elyssa Redden, Cori Carter and Ana Joros read tests for participants. Our show memories will be immortalized through the efforts of videographer, Christy Cragin, and photographer, Lauren Crawford. The videos will be particularly helpful in improving our performances for next time. Thank you to everyone for a really GREAT (and beautiful) show! We had thirty-two riders in our most recent clinic with Fred. Ten of them are featured in the attached quadrille: Xintong Bao on StarDuster, Kris Cooper on Wally, Sarah Gates on Bonnie, Ana Joros on Dapper, Mike Lacey on Pik Aro, Cindy Loftus on Kaseem, Elyssa Redden on Belle, Sarah Sherry on Dillon, Mary Snyder on Shade and Val Ritterbusch on Opie. This video would not be possible without taping by Don Ritterbusch and uploading by Mike Lacey. Thank you!! Gathering of our Centaur Rising "Family"
A big thank you to our clients who ventured out in the fog and the mist to our potluck. We talked about fundraising, volunteers for our upcoming horseshows and our 2009 Horse Camp counselor policy. Kris challenged all students to be able to recite Centaur Rising's mission statement. Sign up sheets for riding school horses in our dressage shows and volunteers for the horse shows are on Centaur Rising's bulletin board. You can also see who has mastered the mission challenge. Elyssa Redden was the first to do so, then Diane Carter and Cathlin Rice. Yay! I Kris Cooper, the Executive Director of Centaur Rising, have maintained a FaceBook page for TWO YEARS. It's only recently that I've enjoyed so much keeping track of former students. Derek Trask, for example, will graduate from the Colorado School of Mines in December. He's already accepted a great job offer! As I wrote on April 8: " Thank you to the young people, many former students, who have trusted me enough to confirm me as a [FaceBook]'friend'. You have all been a very important part of my life. I continue to care about your challenges and dreams. " I'm especially proud of those of you who are struggling so hard to get good grades in college. Like Derek, it will all pay off one day! If you are on FaceBook, please ask me to be your friend. If you are not and want to give it a try, go to FaceBook.com. We continue to receive the generous support of some amazing angels. Margaret Berry donated $300 toward Splash's vet bill. Mike Lacey did the same for another vet bill. Karissa Melling donated $200 to support the upkeep of the horses as did Susan Warren. During these horribly bleak economic times this unsolicited help is SO much appreciated. Thank you. Thank you. Thank you. Kris and board member, Valerie, have also posted our Horse Camps on YourHub.com. 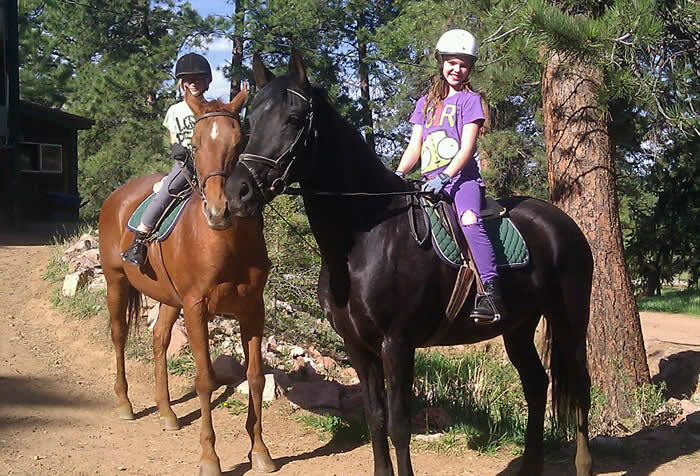 If you've experienced our Horse Camps and have time to post a review, please go to http://denver.yourhub.com/Conifer/Events/Children. We'd really appreciate it! We also have posts in Evergreen, Golden, Castle Rock, Castl Pines, Highlands Ranch. And hey, sign up for Horse Camp! Stacey Page's family is the proud new owner of "Sonny", Marlene Schulte's red-dun quarterhorse gelding. We are happy to have Sonny return to Anchorage Farm! We hope to not lose track of Marlene. She's been a great asset to our programs and lives nearby. Kris' report on this symposium is now available. It will be included in the Centaur Rising "Spotlight" soon to be distributed. Watch for it! You can also read a report on the Symposium in the January edition of the Rocky Mountain Dressage Society's newsletter, the "Centaur". There is also an article by Beth Baumert in the January edition of "Dressage Today". Beth Baumert, by the way, recognized Kris and greeted heartily at the Symposium. Beth is technical Editor of "Dressage Today" and presented a clinic at Anchorage Farm in October 2004. Our "Partners" page now lists all of the individuals and businesses that have contributed $100 or more to Centaur Rising. The level of support is the same as that shown here. We cannot tell you how much we value this support. Our work would not be possible without these generous supporters. THANK YOU!!! Worried about the economy? See what StarDuster has to say. Caitlin Estill, age 8, conducted a science fair experiment at Anchorage Farm. The topic concerned horse food preferences. She won Best of Category, Zoology, at Parmalee Elementary among the K-3rd entries. Way to go, Caitlin! I'll bet you didn't know it! Our newest (and currently most popular) school horse appeared in Ponderosa High's "Annie Get Your Gun". See for yourself! You saw it here first! The Board of Directors of Centaur Rising voted to hold a client meeting at Anchorage Farm on April 18, 2009. We plan to have a potluck to fill you in on a lot of things: our summer dressage shows, horse camps and other ways YOU can be a bigger part of Centaur Rising. It's not just a meeting for clients. Anyone can come! Tell your friends! We also received an e-mail from former student, Derek Trask, who says he plans to graduate from the Colorado School of Mines in December with a degree in Mechanical Engineering. We're very proud of both of you!!! "In Search of Oneness Workshops"
"Horses are important in our lives because they enable us to communicate, not verbally as we do with other humans, but through developing our tactile and intuitive skills. Unfortunately negative emotions, lack of knowledge and somewhat naturally incompatible (human-on-horse) bodies get in the way of better communication. Our one-day-plus workshop is designed to help us better understand and enhance the horse/human connection." Please join us! You'll have fun, meet some great people and learn a lot too! Riders of all levels/disciplines and non-riders are welcome. All proceeds will support the work of Centaur Rising. Centaur Rising received its first check today from the United Way. Thank you to those who chose this avenue to contribute to the philanthropic work of Centaur Rising. You're the greatest! For a collage of photos of Splash and the condolences/rembrances of just some of his humans, please click here. Deanna Morin called from the Upper Peninsula of Michigan. 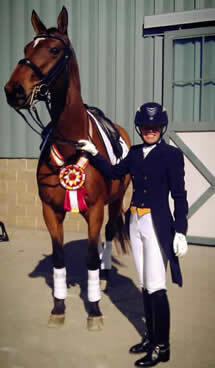 Her daughter, Denise, began her dressage career at age five under the tutelage of Jim and his former wife, Sierra Dall. Deanna reports that Denise (Potts) is now riding grand prix in North Carolina. Wow! Yes, we plan to host six Horse Camp this summer. We are redesigning the camps to make them more true to our mission of restoring Man's Connection with Nature. We also want to give more emphasis to dressage. Dates appear on our Horse Camp page. Adults are welcome to attend Horse Camp too! And don't forget our two dressage shows this summer. See our Events page. Jim and Kris were most honored to give dressage lessons to two visitors from Peru: Armando Robles and his nine-year-old son, Armando. 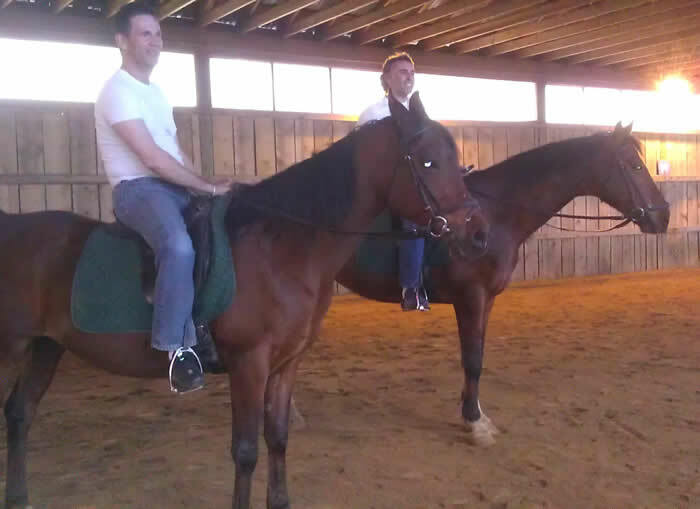 The elder Armando owns an imported Hanoverian and takes lessons in Peru from an instructor from Germany. It's always a bit intimidating to instruct a foreign visitor, especially one with ample training. Yet we always find many points that can be improved. The Robles' loved their lessons and will take a couple more before they return to summer in Peru. Valerie Ritterbusch brought her second horse to Anchorage Farm. Calliope is a fifteen-year-old Holsteiner that Valerie trained and showed to second level. Valerie has graciously allowed Centaur Rising to use "Opie" in our lesson program. "Opie" is a big (17 hand) gentle giant and a great addition to our program. Thank you, Valerie! In November we distributed an on-line newsletter, the "Spotlight". It talked about the need for additional funds this time of year. December and January are very slow months revenue-wise. In December we followed the e-mail newsletter with a "snail" mailing. Eighteen donors rose to the occasion and generously shared funds sufficient to nearly fill the "empty trough" we mentioned in the newsletter. We cannot say enough to honor these very special "angels". We realize that each donation represents a sacrifice and a choice. There are so many other non-profits that also need funds this time of year. Of course the need has not entirely passed, by any means. The slow economy is coupled with a big increase in expenses. We are most gratified by the support of those who believe so strongly in what we do. It makes us work all the harder and to look forward with zest to the brand new year. Our supporters give us hope that we can survive a difficult economic time. THANK YOU. Jim's former wife, Sierra Dall, spent our traditional Christmas with Jim and Kris at Anchorage Farm. Sierra rode at the FEI level in Michigan in the 1970's. She was a long-time student of Violet Hopkins. Kris had the opportunity to take several lessons with Sierra when she was here. We worked with Connie Williams' mare, Delci, a five-year-old Belgian warmblood in training with Kris and Jim. Sierra helped Kris be all the more cognizant of the sensitive use of her hands. Katryna Evans and Brooke DeVore stopped by Anchorage Farm and visited with Jim. Katy is an apprentice at Stall Ramsbrock in Menslage, Germany. 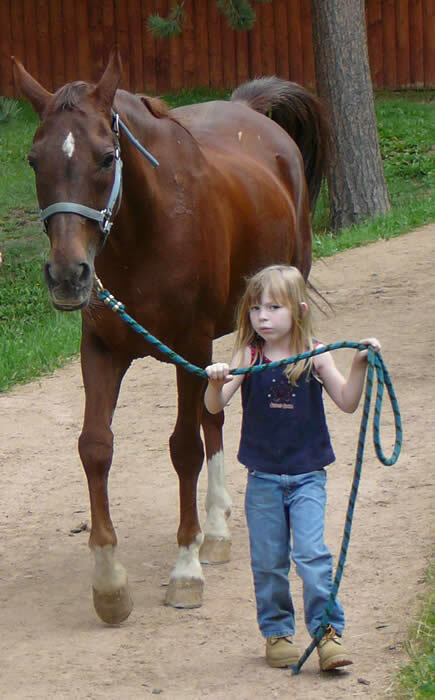 Brooke is employed as a horse trainer in Parker, CO. Katy reports that her previous horse, Roswell Wizard, has been sold and lives on the East Coast. Linda Baur stopped for a visit shortly before Thanksgiving. Linda reports that she still owns the Arabian gelding, NT El Duque, that she bought from Kris and Jim in 1992. Duke is 23 now. Duke once stood as a stallion at Anchorage Farm. Centaur Rising exhibited in the trade show at the USDF Convention December 3-5 in Denver. Kris was able to attend all six of the USDF University educational sessions. She'll be reporting on these soon. Kris was also awarded a scholarship by the Foothills Chapter of the Rocky Mountain Dressage Society to attend the Kyra Kyrkland Symposium at the end of the convention. This was a very much coveted honor. Here is Kris' report on the symposium. Valerie Ritterbusch has entrusted her "28-year-young" gelding to us to be used as a school horse. "Looking Dapper" has been shown in dressage and three-day events. He already has a track record as a kids' school horse. We really appreciate Valerie's confidence in our programs and her belief that we will take good care of the horse she gave to her husband on their wedding day 23 years ago! Freya Kugler's mom reports that she has graduated from college in chemical engineering and is now a chemical engineer at the alternative energy company, Sundrop Fuels. Freya took lessons here from 1993-1997. Claire Filkins and Lindsay Dolan are both juniors at Colorado State University. Derek Trask is a senior at the Colorado School of Mines. We are very proud of the academic success of our former students! Jim and Kris were invited to the show to watch Claire Filkins compete in the First Level Junior Young Rider championship class. Claire also competed Rhythm and Blues at second level in this show. We ran into so many former students or their parents: Debbie Elsner, whose daughter Kim is now a professional trainer competing in this show; Susan Rudman, whose daughter Christina also competed as a professional that day; Pam & Kailey DeVore and Nicolas Sigler. Christina received over 60% on her mare Releve at Intermediare I. Nic Sigler is now competing at fourth level and in fact won the Fourth Level Junior Young Rider championship class! All of these exhibitors took their very first riding lessons from the instructors at Centaur Rising. Christina, Pam and Nic all took lessons with us for eight years or more. We are proud to say they received their foundation here - to enable them to train their own horses to such remarkable accomplishments. Congratulations! This is the first year that Rocky Mountain Dressage Society sanctioned shows have been held at Anchorage Farm under the auspices of Centaur Rising. We are used to having judges evaluate the progress in our training. When you host a sanctioned show, show management must follow all the rules too! That was a little scarey! No worries. We wowed three technical delegates. Out-of-stable exhibitors loved our show venue. All vowed to return. They liked the stabling, the warmup arena, the way they were treated by the show office, and the friendliness of all concerned. We had over forty volunteers! Thank you to the following who made our show a success: Jude Bales (photography), Margaret Berry (scoring), Andy Carter (photography), Cori Carter (tack room support), Diane Carter (volunteer coordinator, parking), Jim Cooper (grounds preparation), Kris Cooper (show manager), Christy Cragin (scoring), Julie & Marcel Flukiger (concessions), Vivian George (sponsorships, hospitality), Doug Jones (arena preparation and stalls), Ana Joros (runner), Jim Joros (parking), Tish Joros (hospitality), Mike Lacey (asst. manager, arena preparation, ring steward, photo processing), Lavila Lawrence (hospitality, concessions), Cindy Loftus (ring steward), Daniel Massopust (runner), Janyn Massopust (scribe), Tom Massopust (arena preparation and signage), Divine Matthews (runner), Dave McGann (help Kaye McGann), Kaye McGann (videography, concessions coordinator), Lora Mihelic (scoring), Dean Miller (concessions), Mark Miller, RN (EMT), Natalie Miller (runner), Ciara Moe (concessions), Abby Page (runner), Pam King (scribe), Elyssa Redden (runner), Cathlin Rice (communications, ring steward, scribe), Sarah Sherry (parking, ground preparation), Aaron Smith (ring steward), Colton Smith (photo processing), Erin Smith (show secretary), Lauren Smith (tack room support, stalls), Mary Snyder (scoring), Acacia Sublette (runner coordinator, stalls), Crystal Sublette (sponsorships, concessions), Dianna Webb (asst. show secretary). Thank you for making our shows so much FUN!!!! We had twelve sponsors. Rocky Mountain Labs provided our new show fence and letters. Kaye McGann donated time and equipment to videotape every ride! Thank you, Kaye! Kaye also organized our concessions stand. Cash sponsorships were provided by the following: Bob & Ann Murtha, Marlene Schulte, Intermountain Rural Electric Administration and Pine Country Feed. Donations of materials were offered by the following: Aspen Park Paint, Moore Lumber, King Soopers, Safeway and Costco. Sponsorships were coordinated by Crystal Sublette and Vivian George. Thank you!!! Read Cathlin Rice's inspirational article about showing her rescued foal here. Our clinic with Fred was a huge success. Fred showed a DVD of Klaus Balkenol coaching the US Olympic team. He also brought a tape of Charles de Kumffy talking about classical equitation. Both videos were most inspiring. This was probably the best clinic we've ever had with Fred. It is amazing how he never fails to teach and inspire us. Clinics are also a wonderful time to get to know other students. And hey, they're FUN!!! We apologize for the delay in telling you about our plans for our youth summer programs in 2008. It's not because we've not been working on them! Dates and options are described here. We are very excited to announce our new Leadership Camp for 2008. We will also be offering our traditional Horse Camp. Our brochure and registration form can be accessed here. We hope you take the time to download and print this information. Don't delay. Sign up today! We have been working with Meg Hill of Colorado Academy to offer a week-long"Interim" program for their students on May 19-23. It will have a format similar to Horse Camp, modified for high-schoolers. This camp will be coordinated by Erin Smith and her sons, Jonathan and Colton. Welcome Colorado Academy! We had a great turnout for our special potluck! Our Board of Directors presented our plans for the summertime: kids' programs, horse shows and fund raising. Thank you to everyone who came. We had a lot of food and camaraderie. Our horse show volunteer signup sheet is here. Please let us know if you want to join the fun. Dressage getaways to Centaur Rising will be featured in the upcoming newsletters for the following USDF organizations: the California Dressage Association, the Georgia Dressage and Combined Training Association, the Dressage Association of Southern California, the Houston Dressage Society and the Arizona Dressage Association. Many of these Group Membership Organizations (GMOs) have also generously featured articles about the work of Centaur Rising. Thank you for your support! Our Executive Director and instructor/trainer, Kris Cooper, rode in a clinic with Paul Belasik, noted classical dressage trainer and author. The clinic was held at 8th Heaven, a new equestrian facility ten miles south of Castle Rock. Mr. Belasik stressed the use of core muscles to collect and support the horse. Kris' mount was her second-level horse, Weltmann. The Rocky Mountain Dressage Society (RMDS) has recognized three shows to be held at Anchorage Farm in 2008. The dates will be June 15, July 29 and August 24. These shows will provide a great opportunity for our students to get show experience right close to home. We have lots of students who have volunteered at RMDS shows in 2007. Their experience will help our own shows be a success in 2008. We hope you join us - as a participant, volunteer or spectator! Click on our prize list here. Our volunteer signup sheet is here. Please join the fun! Kris will be meeting with our riding students in the next couple of weeks to help formulate their goals for 2008. Our goal setting form can be found here. Our planning of Horse Camp 2008 has taken a new course. At present we are planning to scale back our traditional horse camp program. We want to make sure that the program stays in tune with our overall missions. Of primary concern is the development of leadership for our Horse Camp counselors. Our criteria for counselors can be found here. We will keep you posted of our plans. We do intend to provide a Horse Camp program for adults and mature young people. Click here for more information. Kris participated in a seminar by Manuel Trigo in Castle Rock on the subject of piaffe and passage. Piaffe is the high school dressage movement in which the horse trots in place. Passage is a trot with maximum suspension (where all four feet are off the ground). Manuel helped us to understand how introducing piaffe to even young horses can improve their balance and collection. 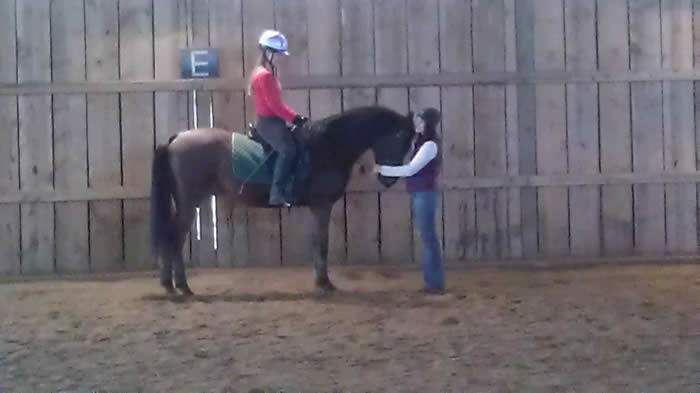 We learned how to know if a horse is ready to piaffe, how to prepare him and how to improve this movement. Manual recommends starting piaffe before passage. Kris' extensive work with her horses "in hand" has helped prepare them for these high level movements. She is anxious to practice (and share with you) what she has learned! You may read her notes here. Even though Kris has been sick, she has been learning a lot. She read Gerd Heuschmann's new book Tug of War. Dr. Heuschmann is a German veterinarian who has treated the results of incorrect training. He explains how many modern horse training methods are in violation of classical principles and how they do in fact physically injure the horse. So much of this substantiates what Kris has been doing to improve the health of her horses through proper training. I'm sure she will tell you more about it as you take your lessons! Kris has also been very much inspired by Linda Kohanov's new book, Way of the Horse, Equine Archetypes for Self-Discovery. Kris was a participant in a clinic with Kohanov in June 2006 where she found the author most compassionate, intelligent and insightful. Kris has summarized the forty insights of this new book. If you are interested, you can read about them here. Linda has done much to help us understand why horses are so valuable in our lives and that there are so many lessons to learn from our horses. 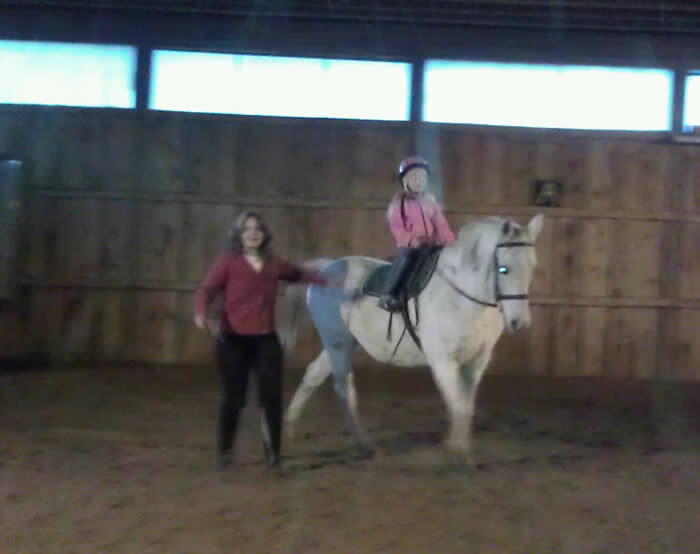 It really inspires us to take more riding lessons! If you are interested in a synopsis of more of Kris' recent reading, "Why We Need Horses", click here. Paula Massopust is proud new owner of Mr. Chips, a 14.2 hand ten-year-old Arab/Appy cross gelding. Mr Chip's team took second place at first level at the Pony Club Nationals in Louisville, KY, last year. We welcome Mr. Chips as our newest boarded horse. At a potluck at Anchorage Farm on Saturday night, January 26, 6:30pm, Fred Kappler talked about his trip to Paris in November to the "Quatre Ecoles" performance. It was the first time that the world's four great schools of classical horsemanship had performed together. These included the schools of Portugal, Spain, France and Austria. Thank you to Fred for sharing his great videos! Claire Filkins and Lindsay Dolan are home from their pre-vet studies at Colorado State University. Claire was here to ride her mom's horse, Filou, saying how much more supple and responsive he's become. Lindsay Dolan's coming to see us on Friday. She says " Kajie looks the best he has looked in a long time". Beth Somers e-mailed us from Maine saying that Solo Bravato's doing great too. Both Bravato and Kajie will be 25 years old next month! Derek Trask is on break from the Colorado School of Mines. We are very proud of our former students who are doing so well in college. The Houston Dressage Society has asked permission to print some of Centaur Rising's articles. We'll update you on what appears when. 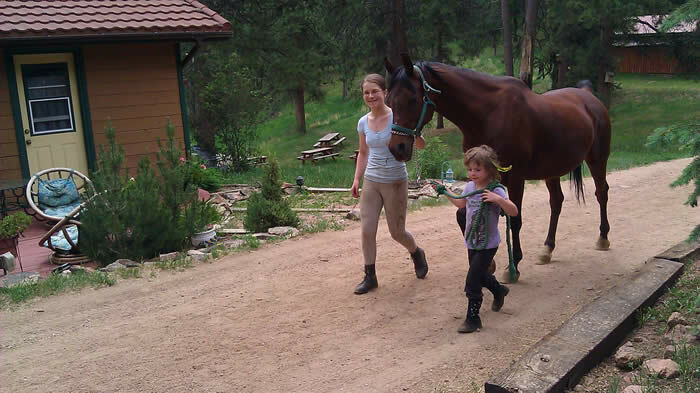 Rocky Mountain Dressage Society has published Are Horses Good for Kids? in their December newsletter, "The Centaur". This article was based on Kris's presentation last March to the American Youth Horse Council. The same article was published in Apples 'n Oats, headquartered in Cedar Rapids, Iowa. We have complimentary copies of this magazine in the arena. Please take one! Congratulations again to Claire Filkins! Claire Filkins, former student at Centaur Rising (now in college at Colorado State University), won the coveted Rocky Mountain Dressage Society "Horse of the Year" award for Junior/Young Riders at training level for 2007. She was riding Rhythm and Blues (RaB), a horse trained by Kris over the winter, and owned by her mother, Karen Filkins. RaB's medians are such that he could have placed top ten in the nation, but there were some errors in the recording of scores by show management that prevented this from happening. RaB earned six scores over 70%. We are very proud of both Claire and RaB! Note that Donntano, also trained by Kris, won the same award in 2004 with Audie Shushan aboard. It is a tribute to Centaur Rising to have our two students' names forever etched on this traveling trophy! Apples 'n Oats based in Cedar Rapids, Iowa, will publish our Are Horses Good for Kids? article in November. Our local Mountain Connection will feature The Annie in My Eyes in December. The Midwest Dressage Association, headquartered in Michigan, will publish the following articles over the next few months: Fountain of Youth (in Nov), Hearing a New Voice, His Horse His Trainer, I Hate Dressage, Teaching Pre-schoolers Dressage, Are Horses Good for Kids?, Teaching Teachers and The Electronic Horseman. The Georgia Dressage and Combined Training Association in Atlanta will run I Hate Dressage in December. A big thank you to Carol Eilers, Jacque Scott, Debbie Paton and Don Faso for their support of Centaur Rising! Our first electronic newsletter has been released! Enjoy it here. Claire Filkins, former student at Centaur Rising, won third place in the Training Level Championship for Junior/Young Riders. 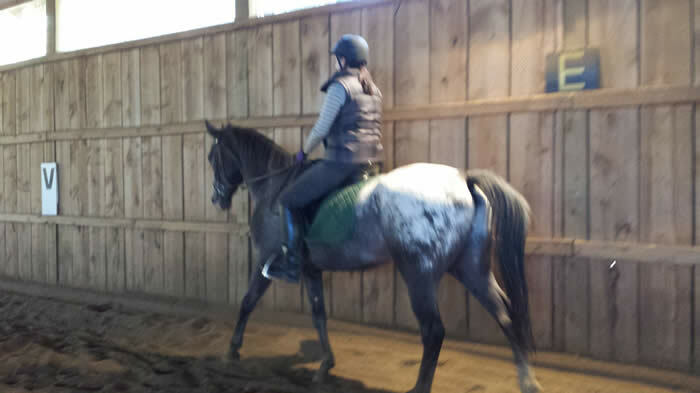 She was riding Rhythm and Blues (RaB), a horse trained by Kris over the winter. Claire earned two scores over 73% at this show. Also showing in Third Level Championship classes were former students Nic Sigler, on RaB's half brother, Royal Diamant, and Brooke DeVore on her mother's horse, Abraham. Former student, Christina Rudman, won the Prix St. Georges Championship for Junior/Young Riders on the horse, Oebalia. This is the same horse that Christina qualified for the North American Young Rider's National Championship show. Full results of the RMDS show can be found here. The photo of long-time student, Linda Baur, could be found on page 2B of the Denver Post. Linda was enjoying the aspens on the Colorado Trail near Kenosha Pass. She was riding her horse, NT El Duque, a 22-year-old gelding, that Jim and Kris Cooper showed at halter, in western pleasure and stood as a stallion at Anchorage Farm. It's great to see them still "out and about" - especially at this beautiful time of year! By the way, Linda got her start showing Arabian horses on Two Blankets, below. Meaghan Quigley, a former riding student at Centaur Rising, is now a college student in Wyoming. 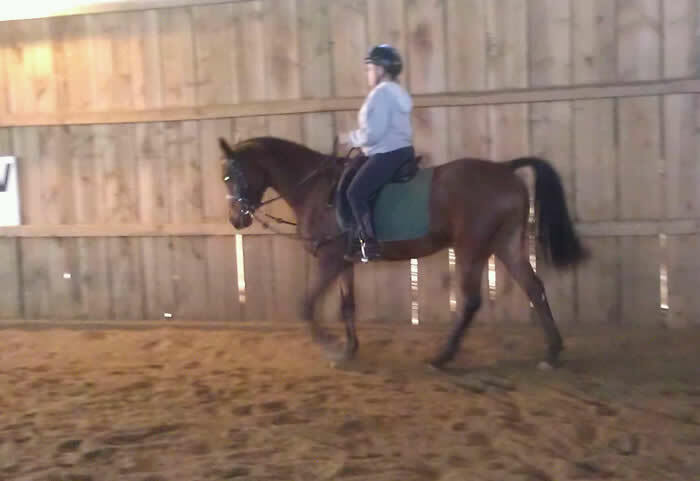 Meaghan has generously donated her throughbred mare, Reluctant Review, to us to be used as a school horse. We are taking "Bonnie" on a trial basis. So far, Bonnie has been very sweet and generous with our students. We are indebted to Meaghan for entrusting her beloved horse to us. Meaghan also gave us an unbelievable cache of tack and equipment. Bless you, Meahan, for your generous heart. We know you miss Bonnie, but we are proud that you are advancing your education! Two Blankets, an icon at Anchorage Farm for 25 years, left our world on August 15, 2007. His memory lives within all of us. He gave lessons to over one-thousand students. He gave confidence to countless timid riders. He launched many students into a lifetime of loving horses. Two Blankets’ generosity and influence were boundless. Please help us honor him. Send your tributes and memories to info@CentaurRising.org. We’d love to include your thoughts in Two Blankets amazing legacy. We’d love to hear from you! Please look here for Lindsay Dolan's wonderful tribute to a beloved friend. In June Kris Cooper and Karen Filkins traveled to Topanga Canyon, California, to look at a new horse for Karen. Our destination was Mill Creek Equestrian Center. We were a bit nervous. Mill Creek is the home of Mette Rosencrantze. Mette was twice a member of the Swedish National Dressage Team and had just won the Grand Prix Invitational on her horse, Basquewille, at the World Cup in Las Vegas, April 20, 2007. Mette was the trainer of the horse we were looking at - Le Filou. Filou, a Westfalian, had been imported from Germany in 2003 as a Prix St. Georges horse. We are happy to say that Karen did purchase Filou. We are even more proud to say how well Karen is riding Filou. Kris was thoroughly impressed with Mill Creek Equestrian Center. Mill Creek has been in Topanga Canyon and owned for over thirty years by Cory Walkey. Cory's voice continues to boom out over the grounds as she teaches her group lessons. Every student, every parent and every employee was so friendly toward us. Mill Creek is home to 31 high-quality school horses. It was amazing to watch Mette Rosencrantze training with the back drop of young riders learning in just the next arena! Talk about inspiration! Evergreen Newspapers sent a photographer and a reporter to cover our Little Kids Camp, June 12-14. Here is their article. The Mountain Connection also featured Centaur Rising in July. Take a look here! Our Executive Director and Board members have been submitting articles for publication in both local and national publications. As they are printed, we will let you know where to find them. In the meantime, we have provided links for you to preview the articles below. If you have feedback of any kind, please let us know. If you know of a publication that might like to feature our articles, please let us know about that too. Are Horses Good for Kids? Hunt Cap or Cowboy Hat? They Eat Hoses, Don’t They? Where Do You Buy Your School Horses? We are proud to say that many of our students are generously donating their time to work at the "Dressage at High Prairie" show. Thank you all for "pitching in". I'm sure you'll have fun and learn a lot too! Donate By Shopping on Line! We have recently been added to the giveline shopping network. Please click here. Giveline donates an average of 16% of the revenue from the purchases made on its website to the charity of your choice. If you are in the market for a book, video or gift for someone; please check out giveline. You will find prices very competitive with other major shopping sites. It won't cost you more. If you click on the icon below, you will automatically donate to Centaur Rising as part of your purchase. What could be easier? Board member Marcy Newman has recently distributed a new brochure, "Is there a horse lover in your house?" to local schools. This brochure mentions research recently completed for the American Youth Horse Council. Thank you, Marcy! We have just received a shipment from the Morgan and Chase Publishing Company. 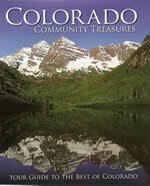 As "Your Guide to the Best of Colorado", these beautiful new "coffee table" books will take you on a tour of some of the classiest dining, lodging and shopping in our beautiful state. Our own Centaur Rising is featured on page 581! If you buy one of these beautiful books at the riding stable, ALL proceeds will go towards the support of our summer Horse Camp programs! Christy Vines, of the Vines Resource Group in Redlands, California, conducted a strategic planning meeting with the Board of Directors of Centaur Rising. We are very honored to have Christy commit her expertise to our cause of working with kids and horses. Thank you, Christy! Our Executive Director, Kris Cooper, made a presentation to the American Youth Horse Council's "2007 NATIONAL YOUTH HORSE LEADERS SYMPOSIUM" in Denver. The title of the presentation was "Youth Involvement with Horses: Future Success in Life". If was based upon interviews with former horseback riding students. We are so saddened to hear of the death of the very first financial supporter of Centaur Rising, Jill Hassler-Scoop. Although we never met her in person, Jill had the hope and trust in what we believe in. We will therefore treasure this and her many other contributions to the equestrian world. Please follow this link to Lendon Gray's observance of this remarkable horsewoman. Jill asked that we "maintain a positive, up-beat, non-judgmental and compassionate attitude towards each other." We appreciate very much the confidence she bestowed on us. It's "words to live by!" Fred Kappler of the Bootjack Equestrian Center in Lake Linden, Michigan, joined us for a recent four-day clinic. This is the eleventh year that Fred has offered clinics at Anchorage Farm. Fred combines both German and French methods of training acquired through a lifelong commitment to dressage. Fred takes regular lessons with Frank Grelo, a student of the late Nuno Oliveira. He has also worked extensively with Dominique Barbier, another student of Nuno Oliveira. We are very excited to welcome our first business partners: Trafalgar Square, publishers of Horse and Rider Books; and Wild Horsefeathers. Please check out their links on our "Links" page. Thank you to these companies for showing their support for Centaur Rising. We hope you do the same by choosing to purchase your books and gifts through THEM! We also wish to recognize Lisa Kolb of Acorn Internet Services for her advice in "search engine optimization". Jim Cooper, the husband of our Executive Director Kris, surprised her with his purchase of a dinner with Debbie McDonald. This dinner will benefit The Breast Cancer Foundation. It is limited to ten special guests. Who is Debbie McDonald? She is rider and trainer of the "best dressage horse in the history of the United States", Brentina. 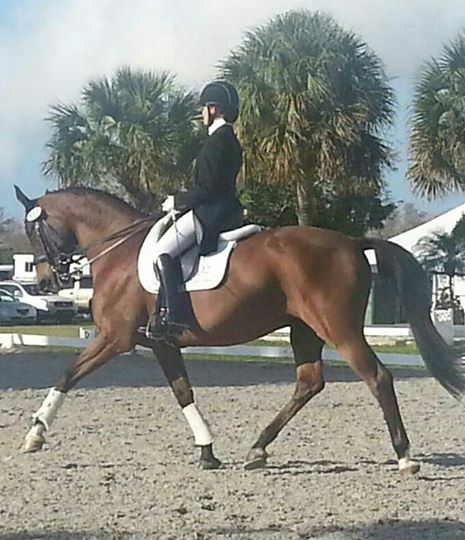 Brentina also happens to be the "aunt" of our own dressage star, Donntano. Stay tuned for Kris' report of her dinner with Debbie and her auditing of Debbie's clinic, May 20-21, 2006. We received an e-mail from Lindsay Kasch, our student 1992-93. 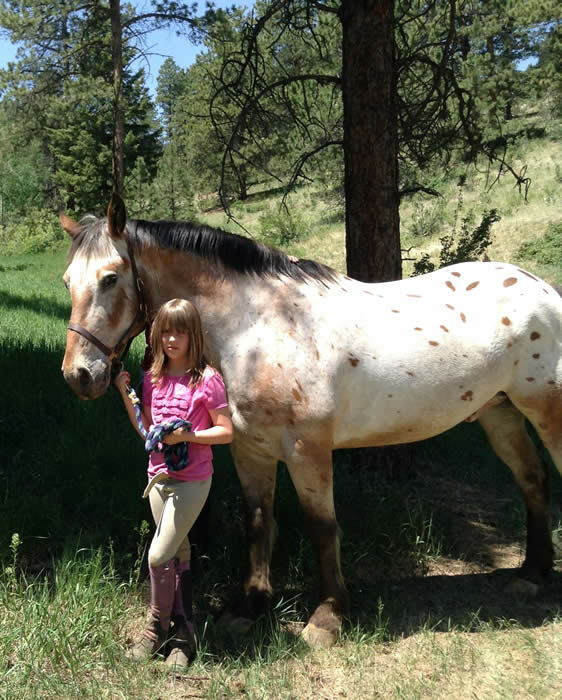 Lindsay was just nine years old when her mother purchased a horse from us. Her name was NT Granada. Granada was 3/4 sister to Moracco and half sister to Senador. They were all born in the same year. Lindsay has since owned "Nada" continuously for the last fourteen years. The pair was highly successful (generally unbeatable) in Arabian hunter pleasure. When Lindsay "grew up" and moved away to Las Vegas, Nevada; "Nada" was still by her side. Unfortunately, Lindsay's news was not good news. Her beloved mare passed away. This is what Lindsay said: "I know that she will always be with me.... Thank you so much for all that you guys did for her and most of all for giving me the opportunity to have such an amazing animal. She really was my best friend and she has meant more to me than I could ever begin to explain." You can e-mail your condolences to Lindsay at ntgranada@hotmail.com. Brooke DeVore, our junior dressage trainer, has been preparing two of the Centaur Rising horses, Donntano and Weltmann, for the 2006 USEF/USDF show season. Brooke showed both horses at second level in the Junior/Young Rider Division at the Rocky Mountain Dressage Society Winter Wake-Up show at Colorado Horse Park on March 18-19, 2006. This is a United States Equestrian Federation High Performance Qualifying show. On Saturday, Wally's scores of 69.2% at second level test one and 68.9% at second level test two were the highest Jr/YR scores of the day! Congratulations, Brooke & Wally! Congratulations to our three students and former students (all students for five years or more!) who were accepted to ride in the Steffen Peters and Janet Brown Foy clinic "Dressage through the Levels". Only five juniors were accepted. Three of them got their start with Centaur Rising's founder! Steffen Peters is a bronze medal Olympic rider. Janet Foy is an internationally rated judge. We are very proud of our demo riders: Claire Filkins (alternate) at training level with her mother's horse Rhythm and Blues, Brooke DeVore at first level with her horse Wild Magic LHF and Christina Rudman at fourth level with her horse, Releve. Congratulations! We are very proud of you. Congratulations to Lindsay Dolan for winning the junior-owner-to-ride trail class at the Scottsdale All Arabian Show on Friday, February 17, 2006, with her top-ten trail horse, Karas Kajie. Congratulations for also earning a 67% in her first dressage test with her new horse, Sabre. Lindsay also won the Hunt-Seat Equitation Championship at the National Western Stock Show in January of this year – not bad for her last year before pre-vet classes at CSU! On December 11, 2005, Kris was privileged to see the final 2005 performance of the Spanish Riding School from the fifth row in Houston's Toyota Center. The School was honoring the 60th anniversary of the liberation by the US Army of the Lipizzaners from the Russian Army. Ironically, just days before Kris's long-time hairdresser, Walter Katzer from Vienna, talked about his own personal reminiscences of being forced by the Russian Army to treat injured war horses at the end of World War II. It was an honor to see the results of correct dressage training as demonstrated by the Spanish Riding School. This is something to which we must all aspire. Kris Cooper, Centaur Rising's founder and President, was very much inspired by the July 30-31 clinic with Eckart Meyners and Hannes Mueller, the head of the German Academy for Professional Riders. Kris and her husband, Jim, had met Mr Mueller and visited his school in Warendorf in 2002. American dressage riders were very much honored to have these two distinguished gentleman work with them. Eckart Meyners, a sports physiologist, is a consultant to the German Olympic Dressage Team. Mr. Meyners has developed a "Program for Better Riding" series of books that discuss his exercises and philosophies. It was astounding to see how improved rider suppleness was able to drastically improve the movements of the horse. This is all the more proof that we must work on ourselves before we can expect to bring out the best in our horses! Brooke DeVore was chosen as a demo rider on her horse, Wild Magic LHF. Congratulations, Brooke!